We’re very pleased to announce some new Additions to Milestone’s trophy case. The results are in, and this January at the HSMAI Adrian Awards Gala, Milestone will be honored with 5 Adrian Awards! Two bronze, two silver, and one Gold! 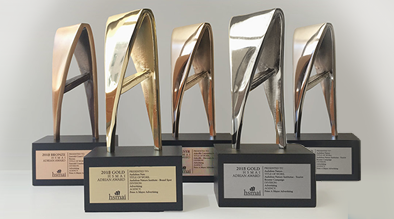 The Adrian Awards recognize excellent digital marketing in the hospitality industry, and this is the third year in a row we have won more awards than the prior year. At Milestone we feel that it’s important to be recognized not only for the visual aesthetics and user experience of our websites, but also because our supporting technology is ground breaking, and the best in the Industry. In addition, Milestone has been recognized by the W3 awards, which celebrates quality digital work from both small and large organizations; as well as, the Davey Awards, a competition that focuses on the distinctive work of smaller agencies. We are humbled that the small amount of submissions we made to these competitions have come back with 100% positive feedback. All of this recognition would not be possible without the incredible Milestone team; building the technology, designing the websites, and working with our clients to bring these projects to life. A big thank you to all the teams involved in each account, and a special shout-out to our Client Services Managers and the Analytics team for helping us craft case studies worthy of submitting to these competitions.